Marathon, Florida is home to the world famous Marathon Seafood Festival that takes place every March for two fantastic day days. Here, visitors will enjoy Florida Lobster, Stone Crab, Fresh Local Fish, Conch Chowder & Fritters, Burgers and Dogs, Key Lime Pie, plus a Nautical Market, and arts & crafts show, a boat show and great live entertainment. Marathon is also home to many waterfront seafood resaturants. 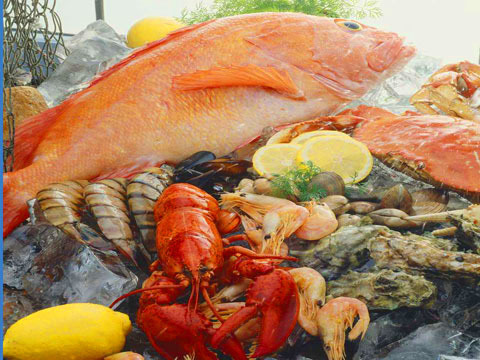 Most seafood restaurants will actually cook your catch! All serve fantastic seafood dishes and the chefs are experts at creating seafood dining experiences that your entire family will remember. Some of the seafood restaurants specialize in seafood smorgasbords. If you’ve ever wanted to enjoy all you can eat seafood, then Marathon, Florida is the place. The Florida Keys are known for having some of the worlds finest shrimp, and no trip to the Keys is complete without trying some “Key West Pinks”. Some of the restaurants located in the Marathon, Florida area are The 7 Mile Marina , Hideaway Cafe and Castaways From casual diners to five star restaurants, you’re guaranteed to find the perfect spot no matter what your craving.